I got notified last night that I am the first place winner of Poly Clay Play’s Monthly Challenge for March. 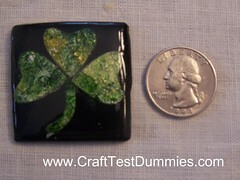 The theme was to make aÂ green (naturally) pin, and I entered my shamrock pin. Hooray for me! I have won a book, and I selected Recycling with Polymer Clay. Sounds right up my alley, doesn’t it? Well, I’m anxious to see what kind of projects and ideas I can pick up. Ok, enough self-congratulations. Back to claying! Yay, Jenny! Good job on the pin — & what a fun-sounding prize, too… Congrats! Congratulations from the runner up — #3!